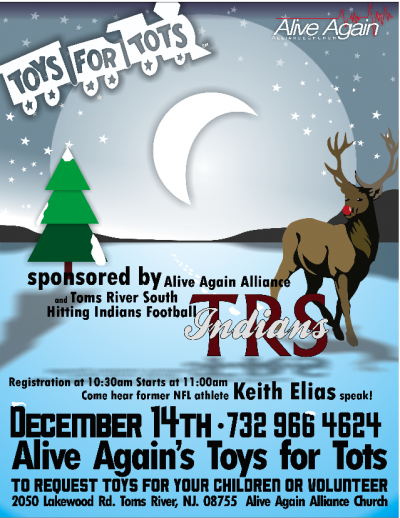 An event to support Toys for Tots at the regional distribution site for Toys for Tots will feature former New York Giants player Keith Elias. The event, taking place in Toms River, is being hosted by the Alive Again Alliance Church and the Toms River South Hitting Indians. The event will be on Sunday, Dec. 14, at 11 AM at Citta Elementary School, 2050 Route 9, Toms River. Registration at the door will start at 10:30 AM. Pre-registration is strongly recommended. For more information, call 732-966-4624.